Today, I was looking for an easy, cute, edible Valentine idea and decided to make another candy dish. Intrigued? Read on. Unwrap the candy, line your springform pan with parchment paper, arrange candy and then put in a 350F oven for about 20-25 minutes – you will know it is ready when you see the candy expand and start to stick to each other. Take it out of the oven and let it cool completely in the pan. Once it is cool it will peel off the parchment very easily. 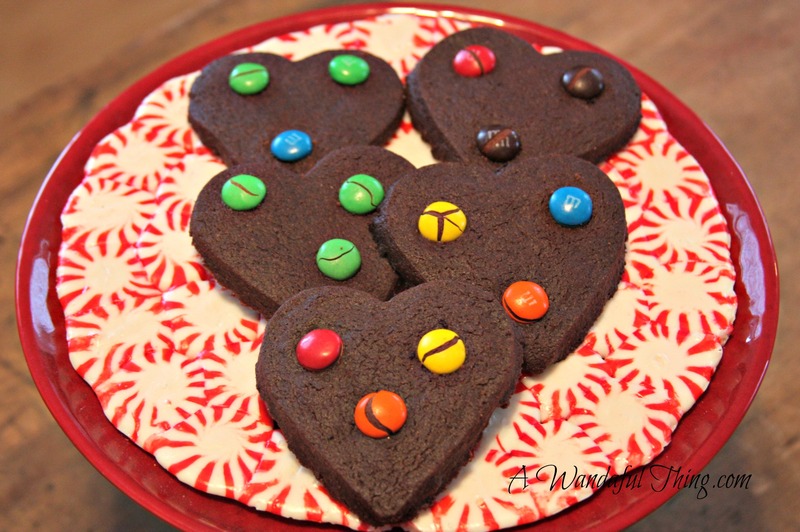 Here is a link to the recipe for the Valentine Chocolate Sugar Cookies, I found it on one of my favorite blogs Kleinworth & Co. Prepare the dough as per the recipe. Using the two pieces of parchment paper (you will know what I mean when you read the recipe) saved me a lot of clean up time, which meant more time for taste testing cookies. My local market did not have any pinkish M&M’s so I went with what they had-they look a little different but taste the same. I love how this looks and the fact you can eat the candy display dish as well as the cookies, well that’s just A Wandaful Thing!!! 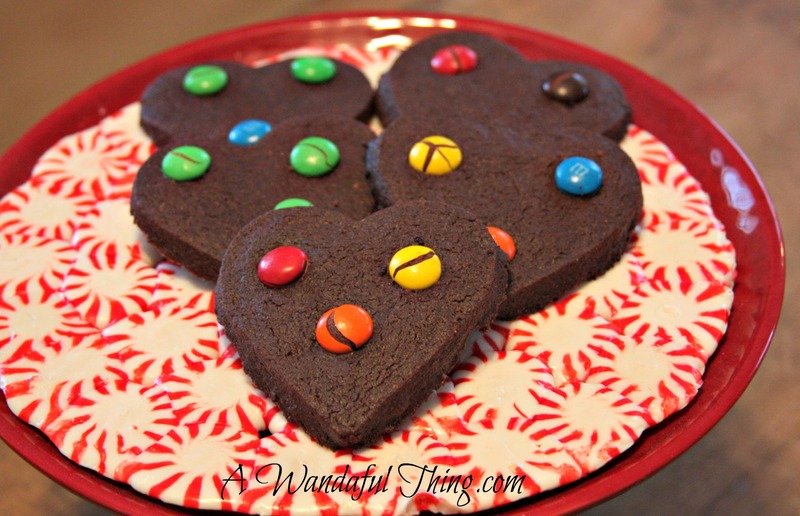 This entry was posted in Bake, DIY, Food, Make and tagged candy, Christmas, cookie, Crafts, creativity, Decorate, dishes, DIY, dollar store, easy, eat, Food, red, simple, Valentine. Bookmark the permalink. They look good enough to use as wall art, as well as eat! 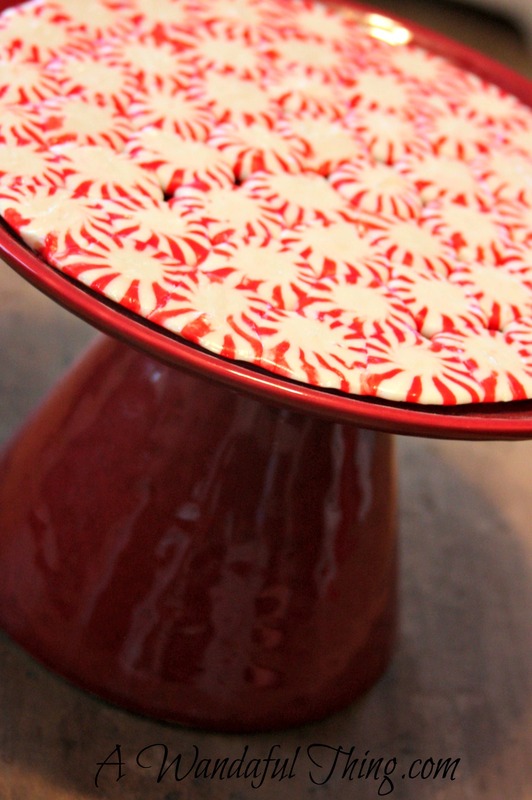 I did not think of that…I suppose if I shellac the candy it would last forever and I could display it as art – thanks for the idea!! They look delicious. Wish I was closer to have a few. Plate a great idea for any time.